There is now ample evidence to indicate that the mammalian limb in general, and the autopod in particular, fulfill the criteria enumerated in an earlier section that increase the potential for evolutionary change in morphology. First, experimental embryology demonstrates that the limb itself is a well-defined module. This is supported by the fact that isolated limb buds left to develop in culture form the normal pattern of skeletal elements (Searls, 1968), and entire limbs can be induced from the flank of chick embryos by application of appropriate growth factors (Cohn et al., 1995). The limb is therefore a trans-plantable, isolatable embryonic landmark that has the potential to develop autonomously, once limb bud formation is initiated and the appropriate selector genes are expressed. The autopodial region also exhibits several features characteristic of a submodule within the limb bud (Richardson, 1999). As mentioned in an earlier section, modules are discrete units of development produced by a hierarchy of genetic interactions within a bounded spatial domain (Gilbert et al., 1996). Autopodial development involves a distinct third phase of Hox gene expression regulated by a single "global" enhancer and the sequence of Hox gene transcription in the autopod is the reverse of that observed in the zeugopodial region (Hérault et al., 1998). Furthermore, chondrogenesis in the autopod involves Activin A expression, whereas this growth factor is not able to induce chondrogenesis in more proximal limb elements (Merino et al., 1999). Thus, the autopod is a unit of development with a distinctive hierarchy of genetic interactions within a clearly defined spatial domain (Chiu and Hamrick, 2002). This compartmentalization allows for changes in one aspect of gene function and cellular patterning without affecting another (Carroll et al., 2001). Figure 2. Hindfeet of peramelid marsupials showing variability in autopod morphology. From left to right: Perameles, Peroryctes, Macrotis, and Chaeropus. Adapted from Howell (1944). Figure 3. 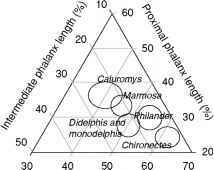 Ternary plot of relative hindfoot segment lengths in didelphid marsupials (n = 6 per genus). Length of the third metatarsal, proximal phalanx, and intermediate phalanx is divided by the total length of the three segments added together multiplied by 100. The ellipses enclose the range of individual values for each species. 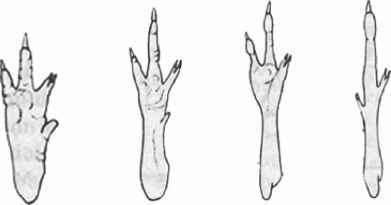 in the relative length of their toe segments (Figure 3; see also Lemelin, 1999). Hence, the evidence from extant clades of birds and mammals is consistent with the hypothesis that related taxa diverge from one another in skeletal form and postural behavior primarily by modifying autopod morphology. The second piece of evidence for evolvability in the autopod is redundancy, demonstrated by Hox gene knockout experiments and analysis of heterozygote crosses. Mice heterozygous for a mutation in the Hoxd13 gene sequence (Hoxd13+/-) show a mild phenotype (36% penetrance) characterized by a sixth digital rudiment and misshapen carpal bones (Davis and Capecchi, 1996). Mice homozygous for the disrupted HoxD13 sequence (Hoxd13-/-) show a more severe autopod phenotype that includes the presence of interdigital webbing, reduced second and fifth digits, and fusion of the first metacarpophalangeal joint (Dolle et al., 1993). Likewise, mice heterozygous for a mutation in the Hoxa13 gene sequence (Hoxa13+/-) show only a reduced first digit compared to normals, whereas mice homozygous for the disrupted Hoxa13 sequence (Hoxa13-/-) usually die in utero and lack all forelimb digits except one (Fromental-Ramain et al., 1996; Mortlock et al., 1996). However, when Hoxd13 heterozygotes (Hoxd13+/-) are crossed with mice heterozygous for the Hoxa13 mutation (Hoxa13+/-), the phenotype is much more severe and resembles the condition seen in the Hoxd13 homozygous (Hoxd13-/-) mutants (Fromental-Ramain et al., 1996). These results indicate that Hox proteins function in a partially redundant manner in which the severity of the mutation is proportional to the total Hox protein "dose" (Favier and Dolle, 1997; Zakany et al., 1997). Results from these and other knockout experiments show that redundancy of Hox function in the autopod does reduce the lethality of mutation, while at the same time providing a potential source for pheno-typic variation. The experiments noted in an earlier section also provide evidence for weak linkage, or flexibility of transcriptional regulation, in autopod morphogenesis. 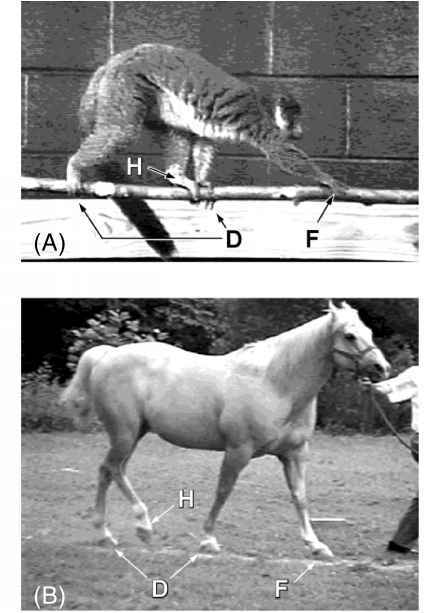 Different Hox proteins are quite similar to one another in form and, as shown from many of the knockout experiments referred to in an earlier section, can bind to the same DNA sequences and initiate transcription of the same target genes (Krumlauf, 1994). Evidence from experimental genetics also confirms that the autopod is relatively robust to mutational changes in the expression of genes involved in skeletal patterning. Growth and differentiation factor-5 (GDF-5) is a signaling molecule that is expressed at various times and locations in the developing limb. In the developing digits, GDF-5 initially has a broad expression domain surrounding the presumptive joint region in which it promotes epi-physeal chondrogenesis, whereas later in limb development, during the process of joint formation, its expression is limited to the joint interzone (Storm and Kingsley, 1999). Mutations in GDF-5 produce a variety of limb defects, referred to as "brachypodism," which include fusion of the proximal and intermediate phalanges in mice (Storm et al., 1994), and severe reduction of the intermediate phalanges in humans (Polinkovsky et al., 1997). More minor alterations include a pollex that is medially divergent compared to that of normals. GDF-5 is not expressed in developing nerves, blood vessels, or muscle precursor cells. These tissues invade the limb normally in brachypod mice, but the muscle attachments differ from those of normals due to the defects in skeletal and tendon patterning. For example, flexor digito-rum superficialis sends a tendon to the pollex in brachypod mice but not in normals (Gruneberg and Lee, 1973). This illustrates a key feature of robus-ticity in developmental patterning of the autopod—mutational changes may be confined to the cartilage rudiments forming future skeletal elements but need not be accompanied by mutations in nervous, vascular, or muscular systems to yield a new, fully viable phenotype (Kirschner and Gerhart, 1998).